In the 1950’s IBM came to the Washington Aluminum Company with a problem. They had started manufacturing and selling a new piece of equipment called the mainframe computer. IBM needed someone to build a stand or platform to support the weight of this machine and create easy access for the wires and cooling of the equipment. Sitting in that room were a few people including Earnie Liskey and Jim (Bill) Irvine. This was the beginning of the access floor industry. A short time later these men created the Liskey Aluminum Company of Baltimore, Maryland and the first production access floor systems were manufactured. The installation of the new access floor system required a highly specialized installation team, so Irvine Erectors was formed in 1961 and was headed by Bill Irvine. The Irvine team traveled throughout the 48 states installing raised floors and making connections in the industry. Over the years, the access floor industry continued to grow and the demand also grew for accessories, such as steps, ramps, and handrails. Bill Irvine and his son Charles began making accessories for the industry prompting the purchase of a small shop in the late 1960s. This launched the larger-scale production of specialized access floor accessories. 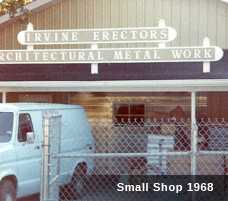 Shortly after the shop was acquired, Tate became one of Irvine Erectors biggest customers, which was the beginning of a 50 plus year relationship. The installations and accessories production continued successfully for many years. In 1982, Charles Irvine once again expanded to form a sales and distribution company and incorporated as Irvine Access Floors, Inc. This path led Irvine to become a complete Tate distributor and their number one dealer for over 20 years. In 2013 Tate turned 50 and we are happy to have contributed to their success. Today, Irvine Access Floors, Inc. has grown to be nation’s largest access floor contractor and distributor with well over 50 million square feet installed. We continue to strive and build on our long history of excellence as the innovators for the installation of access floors and related products.